A correct pelvic tilt is important to female reproductive and sexual health. A woman’s pelvis, as well as sacrum, can become either more tilted forward, backward, twisted left or right, or a combination of those tilts. This malpositioning causes female organ problems such as menstrual problems, PMS, cysts, fibroids, endometriosis, tumors or infertility. The angle of the pelvis is important to reproductive health, the nervous system, and blood circulation. The tilt of the pelvis can worsen when one’s posture worsens. 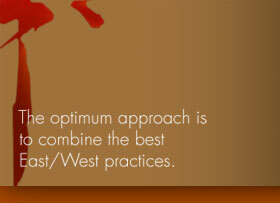 The use of the Yin Yang Body Pyramids can help restore good posture and return the pelvis to its standard angle. So, exercising on the Yin Yang Body Pyramids can improve female organ health and has the potential to restore fertility to many women. The Yin Yang Body Pyramid exercises help the spine create a healthy curvature, especially changing the spine from T10 through the sacrum. This helps the spine to open and balance, and improves lower abdominal circulation. 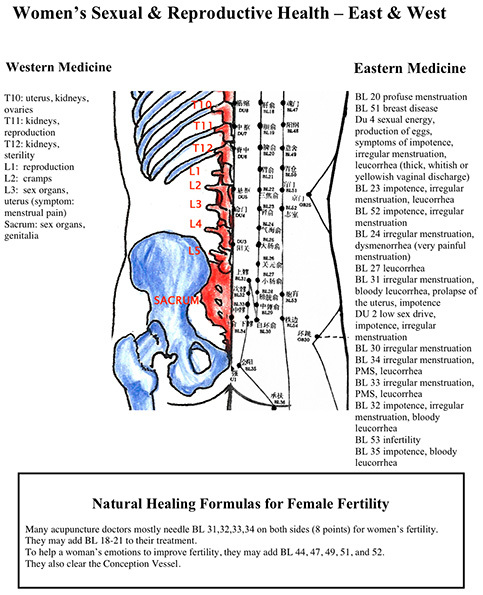 In the treatment of women’s sexual and reproductive issues, Western medicine concentrates on 1) the endocrine system and hormones (pituitary gland, pineal gland thyroid, parathyroid, thymus, adrenals, pancreas, ovaries), and 2) the lower spine, because this part of the spine controls the female organs. Natural Healing’s approach to women’s health, in contrast, concentrates on clearing the meridians of the female organs to balance yin and yang. Work is done on special acupuncuture points for the female organs. See the diagram below.